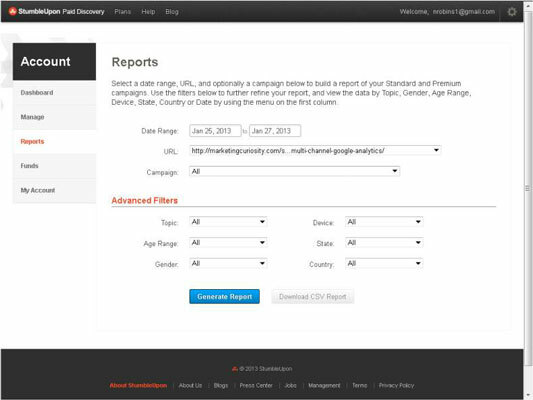 After a couple of days of running a Paid Discovery campaign on StumbleUpon, data are now ready to be analyzed. This begs the question: How do you know whether Paid Discovery is working? For exposure, you look at total traffic generated and sharing activity. In traditional marketing, the metrics commonly used for exposure are impressions and engagement. An impression is technically every time someone might see your content, so impression is calculated every time the StumbleUpon feed page is loaded. Now take the sum of campaign costs and divide by the total engagements (traffic and sharing). This is called cost per engagement. Now, compare the cost per engagement of Paid Discovery to other channels in your marketing mix like Paid Search, Events, TV ads, Radio, etc. You’ll get a really good bottom-line sense of the performance of your Paid Discovery campaign. 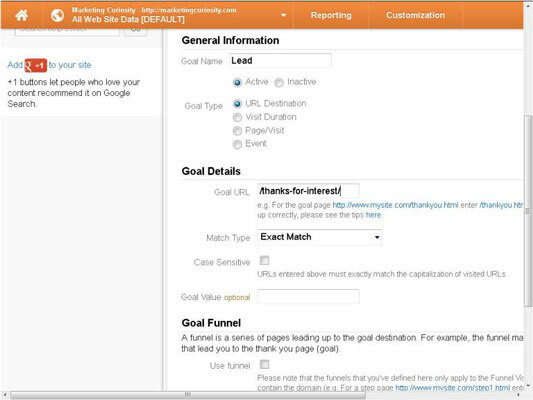 For leads, you’ll have to do a little setup with your web analytics service. It’s fairly easy to set up in Google Analytics, which is the most common (and free) web analytics service. Here’s how to do it. Go to Google Analytics and sign up for an account. After signing into Google Analytics, click the Admin link located in the upper right of the page. Click your profile name, and then click Goals on the next page. If you’ve already set up a couple of goals, you see a list of them here. To add a new goal, click +Goal. Name the goal, so it’s easily identified in reports. Click the Active radio button, and then click the URL Destination radio button. If you have Thank You pages set up after someone submits his or her contact information — and you should — copy and paste the last part of the web address into the Goal URL field. For example, if your Thank You page address is http://www.marketingcuriosity.com/thanks-for-interest, copy and paste /thanks-for-interest into the Goal URL field. Then choose Exact Match on the Match Type drop-down menu. Exact Match means that Google Analytics will only record the goal if the last part of the web address matches the Thank You page exactly. If you know what a lead is worth to you as a business, enter the dollar amount (without the $) in the Goal Value field. Finally, click Save, and your goal is now set up. Make sure to set up goals in Google Analytics before you launch a Paid Discovery campaign, or you lose valuable data for analyzing lead generation! The calculation to use for lead generation is cost per lead. Add up all the leads generated during the Paid Discovery campaign and divide them by the sum of your campaign costs. 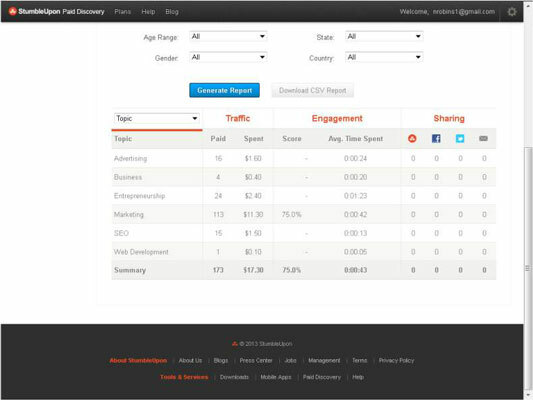 Now compare Paid Discovery cost per lead to other channels in your marketing mix. To get to your revenue numbers and attribute them to a specific marketing channel, you need to have e-commerce tracking set up if you sell products or services directly on your website. Or, you need to pull your web analytics stats into your Customer Relationship Management (CRM) software program. After you start importing web analytics into your CRM software, you can attribute revenue to Paid Discovery. Google Analytics has a really good e-commerce tracking option, and High Rise or Salesforce are good options as your CRM systems. You need to look at total revenue and average order value. Average order value is the average amount of money someone pays you at checkout. Take these two metrics and compare them against other channels in your marketing mix. After you analyze the data and determine what’s working and what’s not, it’s time to make some tweaks to your campaign to do more of the good and less of the bad. First, make another visit to StumbleUpon Paid Discovery and sign in using your Paid Discovery username and password. Next, click Reports on the navigation menu on the left side of the page. To keep the analysis simple, set all the drop-down menus to All so that you are able to compare the various criteria against each other. Click Generate Report. When the page reloads, you see a nice-looking chart that gives you a breakdown of traffic, engagement, and sharing metrics. To see a different breakdown by gender, age range, device, country, state, or date, click the drop-down menu in the upper-left portion of the chart and make a choice there. You can see that marketing and entrepreneurship are the top traffic drivers to the campaign web address. The campaign goal is to increase exposure for Marketingcuriosity.com, and the marketing topic is clearly achieving this goal. If you’re the one running this campaign, just pause the campaign (it’s been running for two days at this point) and relaunch a new campaign targeting only the marketing and entrepreneurship topics. The idea here is the campaign had targeted interests broader than marketing and entrepreneurship, and now you want to limit the campaign to just those topics. The point of making these optimizations is to control spending by targeting the best-performing criteria within your campaign. You want to drive down the cost per engagement and cost per lead/acquisition in basically anything in marketing. The beauty of Paid Discovery is that you have the ability to optimize on the fly.